Lorenzo Snow (April 3, 1814 – October 10, 1901) was an American religious leader who served as the fifth president of The Church of Jesus Christ of Latter-day Saints (LDS Church) from 1898 until his death. Snow was the last president of the LDS Church in the nineteenth century and the first in the twentieth. Snow was the fifth child and first son of Oliver Snow (September 18, 1775, Massachusetts – October 17, 1845, Illinois) and Rosetta L. Pettibone (October 22, 1778, Connecticut – October 12, 1846, Illinois), residents of Mantua Township, Ohio, who had left New England to settle on a new and fertile farm in the Connecticut Western Reserve. Lorenzo had siblings Leonora Abigail Snow (1801–1872), Eliza R. Snow (1804–1887), Percy Amanda Snow (1808–1848), Melissa Snow (1810–1835), Lucius Augustus Snow (born 1819), and Samuel Pearce Snow (born 1821). Despite the labor required on the farm, the Snow family valued learning and saw that each child had educational opportunities. Snow received his final year of education at Oberlin College, which was founded by two Presbyterian ministers. Snow later made his living as a school teacher when not engaged in church service. The Snow home in Mantua, Ohio. In 1831, Joseph Smith, the Latter Day Saint prophet, took up residence in Hiram, Ohio, four miles from the Snow farm. The Snow family was Baptist, but soon took a strong interest in the new religious movement. Snow recorded that he heard the Book of Mormon being read aloud in his home in Mantua and met Smith at Hiram in 1831. By 1835, Snow's mother and his older sister Eliza, had joined the Latter Day Saint church. 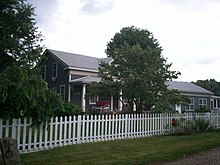 Eliza soon moved to the church headquarters in Kirtland, Ohio, and worked as a school teacher. She, in her biography of Snow, claims to have fostered his interest in Mormonism while he was at Oberlin. Eliza invited Snow to visit her and attend a school of Hebrew newly established by the church. During his visit there, in June 1836, Snow was baptized by John F. Boynton, a member of the Quorum of the Twelve Apostles. While living in Kirtland in 1837, Snow was called to serve a short mission in Ohio, traveling "without purse or scrip." He recorded that relying on the kindness of others for his meals and lodging was difficult for him, as he had always had sufficient means to care for himself. When he returned to Kirtland in 1838, Snow found Smith's followers in turmoil over the failure of the Kirtland Safety Society. Snow and the members of his extended family chose to move to Missouri in the summer of 1838 and join the Latter Day Saints settling near Far West. Snow became seriously ill with a fever, and was nursed for several weeks by his sister Eliza. On his recovery, Snow left for a second mission to Illinois and Kentucky in the fall of 1838. He served there through February 1839, when he learned that the Latter Day Saints had been expelled from their settlements in Missouri. He traveled home by way of his former mission area in Ohio. He was again taken ill and was cared for by members of the church. He remained in Ohio, preaching and working with church members until the fall of 1839. During the school year of 1839–40, Snow taught in Shalersville, Ohio. He sent money to his family, which had by then settled in Nauvoo, Illinois; he joined them in May 1840. Shortly after he arrived in Nauvoo, Snow was asked to serve a mission in England. After an unpleasant sea voyage from New York City, Snow met with some of the members of the Quorum of the Twelve who had opened the British Mission in 1839, including Brigham Young, Heber C. Kimball, and Parley P. Pratt. Snow worked briefly in the Manchester area, and had success in Birmingham, where he baptized people in Greet's Green and organized a branch in Wolverhampton. Snow was assigned to preside over church members in London. During his administration, church membership in the city increased from approximately 100 to 400 members. He was released from his mission by Pratt, who by then was president of an expanding European Mission. Snow arrived home on April 12, 1843, and was accompanied by a shipload of 250 British converts. After visiting with his family, Snow again secured a teaching position for the winter, teaching at Lima, Illinois, thirty miles from Nauvoo. In late spring 1844, he returned to Ohio, preaching and baptizing new converts and distributing recent church publications to members. He was working in Cincinnati, Ohio, when he learned of the assassination of Joseph Smith. Snow closed his Ohio mission and promptly returned to Nauvoo. During the period of disorganization and schism that followed Smith's death, Snow chose to follow the Quorum of the Twelve under Brigham Young. In 1845, Snow was involved in work in the Nauvoo Temple. Before leaving Nauvoo, Snow accepted the principle of plural marriage and took two wives. Later, he took seven more. Sarah Minnie Ephramina Jensen (10 October 1855 Brigham City, Utah - 2 January 1908). Married 12 June 1871. Snow and his family, with wagons and livestock, joined a group of emigrants and moved across the Mississippi River into Iowa in February 1846. On the way west, Snow again became ill and the family stopped at Mt. Pisgah, Iowa. Three Snow children were born at the Mormon refugee settlement, but none of them survived. Snow was called to preside over the church organization in Mt. Pisgah and actively raised money to assist the bands of emigrants in their move west. The Snow family arrived in the Salt Lake Valley in 1848. In 1849, Snow was called to the Quorum of the Twelve Apostles. He was added to the Quorum on the same day as Franklin D. Richards, Erastus Snow (a distant cousin), and Charles C. Rich. They were called to fill vacancies caused by the re-establishment of the First Presidency and Lyman Wight's apostasy. Shortly after his call to the Twelve, Snow left on a mission to Italy and French-speaking Switzerland. He later sent missionaries under his direction to India (1849–52). Snow was directly involved in missionary work in Italy and Switzerland, and also preached in Malta. He had planned to visit India, but various circumstances prevented this journey. Snow began his mission in Italy among the Waldensians, an ancient sect of Christians who inhabited the Piedmont Valleys in the Alps. (Waldensianism predates the Reformation by several hundred years and is completely separate from Catholicism.) Snow and his companions Joseph Toronto, Thomas Stenhouse, and Jabez Woodard initially had very little success in converting the Waldensians to Mormonism. However, after healing a three-year-old boy named Joseph Gay, they began to find converts. In the end, more than 150 Waldensians converted to Mormonism, and 70 eventually emigrated to Utah. In 1850, Snow wrote a pamphlet entitled "The Voice of Joseph" to advance missionary work in the Italian mission. He was unable to find anyone in Italy to translate it so sent it to Orson Pratt, then the president of the British Mission, who eventually found someone in Paris to translate it. In 1851, Snow published a pamphlet entitled "The Italian Mission" about the church's missionary efforts in Italy. It was published in London. In January 1851, Snow went to England and found a person there whom he hired to translate the Book of Mormon into Italian. The efforts of missionaries under Snow, especially the ones he sent to Turin, inspired an article attacking the Mormon missionaries for undermining the Roman Catholic Church in the Turinese paper, L'Armonia. Snow and his successors were unsuccessful, winning fewer than 200 converts, all of whom had either emigrated or were excommunicated by the time the mission closed in 1867, in no small part because of Italian laws that circumscribed publication of non-Catholic religious materials. On his return to Utah Territory, Snow founded a society called the Polysophical Society to conduct study into the various aspects of human knowledge. He encouraged church members of all ages to join and some view this organization as a predecessor of the church's Young Men's Mutual Improvement Association. In 1853, under the direction of church president Brigham Young, Snow brought additional settlers to Brigham City, Utah. Settlement had begun on a limited scale at this site under the name "Box Elder." Snow changed the name and moved the community towards living up to its name. He was also a key backer of the Brigham City Cooperative, which was the inspiration for ZCMI and other cooperatives. In 1864, Snow was sent on a mission to the Sandwich Islands. He went on this mission with Ezra T. Benson and Joseph F. Smith. The mission was prompted by messages from Jonatana Napela and other Hawaiian church members about the irregular administration of the church by Walter M. Gibson. While in Hawaii, Snow was seriously injured but was healed through the ministration of holders of the priesthood. Snow tacitly helped engineer the 1901 election of Thomas Kearns, his friend and a wealthy Catholic, to the United States Senate. Though this was criticized at the time and subsequently, the election of a non-Mormon may have helped Utah retain its statehood, and contributed to a detante between the LDS Church and the non-Mormon journal the Salt Lake Tribune. In 1872, Snow became the president of the council. He held this position through the end of 1881. While president of the council Snow had contact with a political delegation from Japan that visited Utah and influenced his later decision to send missionaries to Japan. In 1882, Snow remained a member of the council but he was succeeded as its president by Joseph F. Smith. In 1884, Snow was succeeded as a member of the council by Franklin S. Richards. President of the Salt Lake Temple (1893–98). When he became President of the Church, Snow was succeeded as temple president by Joseph F. Smith. Between April 1901 and his death, Snow served as the general superintendent of the church's Sunday School. As the church expanded into the surrounding states, members of the Quorum of the Twelve would be sent to other states of assignment. In 1888, Snow went to Rexburg, Idaho, where he told the leaders of the stake that Karl G. Maeser had been appointed Commissioner of Church Education and recommended that they form a stake academy. The local leaders followed Snow's instructions and the institution they formed eventually evolved into Brigham Young University–Idaho, formerly known as Ricks College. Snow was the subject of a United States Supreme Court case regarding polygamy prosecutions under the Edmunds Act. In late 1885, Snow was indicted by a federal grand jury for three counts of unlawful cohabitation. According to his indictments, Snow had lived with more than one woman for three years. The jury delivered one indictment for each of these years, and Snow was convicted on each count. After conviction, he filed a petition for writ of habeas corpus in the federal district court which convicted him. The petition was denied, but federal law guaranteed him an appeal to the United States Supreme Court. In Ex Parte Snow, the Supreme Court invalidated Snow's second and third convictions for unlawful cohabitation. It found that unlawful cohabitation was a "continuing offense," and thus that Snow was at most guilty of one such offense for cohabiting continuously with more than one woman for three years. The first notable action of Snow as president of the church was that he organized the First Presidency almost immediately after Wilford Woodruff's death, rather than waiting years as his predecessors had. As he began his tenure as president, Snow had to deal with the aftermath of legal battles with the United States over the practice of plural marriage. Men engaging in plural marriage were still being arrested and confined in Utah. Some members of the LDS Church did not accept the 1890 Manifesto put forth by Woodruff, and there was a strong division of opinion on plural marriage even in the priesthood hierarchy of the church. The LDS Church was also in severe financial difficulties, some of which were related to the legal problems over plural marriage. Snow approached this problem first by issuing short term bonds with a total value of one million dollars. This was followed by emphatic teaching on tithing. It was during Snow's presidency that the LDS Church adopted the principle of tithing—being interpreted as the payment of 10 percent of one's income—as a hallmark of membership. In 1899, Snow gave an address at the St. George Tabernacle in St. George, imploring the Latter-day Saints to pay tithes of corn, money or whatever they had in order to have sufficient rain. Eventually, it rained in southern Utah. For the remainder of his tenure, Snow emphasized tithing in his sermons and public appearances. By April 1907, the members' practice of paying tithing had eliminated the church's debt. On March 31, 1900, Snow, along with the First Presidency, changed the policy of presidential succession. Under the then-existing rules of presidential succession in the church, John Willard Young would have become the President of the Church when Snow died, as Snow was the only living person who had been ordained an apostle prior to Young. Snow was 85 years old and in poor health, so it appeared to many that Young would be the next president of the church. However, many of the general authorities of the church felt that Young's succession to the presidency would be a disaster for the church. Under the new policy, the new president of the church would no longer be the person who had been an ordained apostle the longest; rather, the new president of the church would be the person who had been a member of the Quorum of the Twelve Apostles for the longest period of time. Since Young had never been a member of the Quorum of the Twelve, he could not become the president of the church if Snow died. On April 5, 1900, the First Presidency and the Quorum of the Twelve unanimously approved the new policy. Snow died of pneumonia in Salt Lake City, and was succeeded in the church presidency by Joseph F. Smith. Snow is credited with succinctly summarizing the LDS doctrines of exaltation and eternal progression, in his often repeated couplet: "As man now is, God once was: As God now is, man may be." Snow's teachings as an apostle were the 2013 course of study in the LDS Church's Sunday Relief Society and Melchizedek priesthood classes. The role of Snow was played by Francis L. Urry in the LDS Church-made film The Windows of Heaven. ^ Snow, Charles C. Rich, Erastus Snow, and Franklin D. Richards were ordained on the same day to fill four vacancies in the Quorum of the Twelve Apostles. ^ "Journal of Book of Mormon Studies 11/1 (2002)". Maxwellinstitute.byu.edu. Retrieved 10 November 2018. ^ Diane, Stokoe, (1 January 1985). "The Mormon Waldensians". Brigham Young University. Retrieved 26 April 2017. ^ "To A Home in the Land of the Free". Ctlibrary.com. Retrieved 10 November 2018. ^ Lorenzo Snow. "The Italian Mission" (PDF). Bellasion.org. Retrieved 10 November 2018. ^ Malmquist, O.N. (1971) The First 100 Years of the Salt Lake Tribune. ^ Paulos, Michael Harold (Fall 2011). "Opposing the "High Ecclesiasts at Washington": Frank J. Cannon's Editorial Fusillades during the Reed Smoot Hearings, 1903–07". Journal of Mormon History. 37 (4): 1–59. ^ "Twenty-First through Thirty-First Sessions". Archives.state.ut.us. Retrieved 10 November 2018. ^ "Public Relations Office – BYU–Idaho". Byui.edu. Retrieved 10 November 2018. ^ a b c d "Chapter 12: Tithing, a Law for Our Protection and Advancement", Teachings of Presidents of the Church: Lorenzo Snow (Salt Lake City, Utah: LDS Church, 2011). ^ Millet, Robert L.; Reynolds, Noel B. (1998), "Do Latter-day Saints believe that men and women can become gods? ", Latter-day Christianity: 10 Basic Issues, Provo, Utah: Foundation for Ancient Research and Mormon Studies, ISBN 0934893322, OCLC 39732987, President Snow often referred to this couplet as having been revealed to him by inspiration during the Nauvoo period of the church. See, for example, Deseret Weekly, 3 November 1894, 610; Deseret Weekly, 8 October 1898, 513; Deseret News, 15 June 1901, 177; and Journal History of the Church, Historical Department, Church of Jesus Christ of Latter-day Saints, Salt Lake City, 20 July 1901, 4. James B. Allen; Glen M. Leonard (1976). The Story of the Latter-day Saints. Deseret Book Company. ISBN 0-87747-594-6. Beecher, Maureen Ursenbach; Paul Thomas Smith (1992). "Lorenzo Snow". In Daniel H. Ludlow (ed.). Encyclopedia of Mormonism. Macmillan. Retrieved 2009-02-26. Daniel H. Ludlow, ed. (1995). Church History: Selections from the Encyclopedia of Mormonism. Deseret Book Company. ISBN 0-87579-924-8. "Lorenzo Snow". Presidents of the Church: 'They that Move the Cause of Zion'. The Church of Jesus Christ of Latter-day Saints, Dept. of Seminaries and Institutes of Religion. 1979. Nibley, Preston (1974). The Presidents of the Church. Deseret Book Company. ISBN 0-87747-414-1. Smith, Joseph Fielding (1964). Essentials in Church History. Deseret Book Company. Snow, Eliza R. (1999) [reprint]. Biography and Family Record of Lorenzo Snow. The Church of Jesus Christ of Latter-day Saints. Snow, Lorenzo (1984). The Teachings of Lorenzo Snow, Fifth President of the Church of Jesus Christ of Latter-day Saints. compiled by Clyde J. Williams. Bookcraft, Inc.
Compton, Todd (Winter 2002), "John Willard Young, Brigham Young, and the Development of Presidential Succession in the LDS Church" (PDF), Dialogue: A Journal of Mormon Thought, 35 (4): 111–134 .